The rune is said to originate from the old Norse word Runa, meaning a secret or mystery. Their main use was that of communication, leaving messages on metal, stone and wood although many believe they were used for religious or mystical purposes as well. There are many theories about who created the runes, one being that the runic alphabet was developed from two sources, one being magical and one literate. The literate theory follows that Runes were created around 100-200 AD among Germanic Tribes and were inspired by Greek and Latin Phonetic alphabets. Later evidence of Runes were found all over Europe and as far north as Denmark and Sweden. As with any language Runes developed and modified over time. As with our alphabet runes have a 24 letter runic alphabet named "futarks" (arising from the first symbols: F, U, Th, A, R, K). This can be used to create directly translated messages from any language into runic. The magical theory follows in folklore where the runes were given to mankind by the all God ODIN (Norse Mythology), who hung himself upside down on the World Tree in a self sacrificing ritual. After nine nights of suffering upon the tree it is said Odin died and passed on to the realm of the afterlife where he gained wisdom and was then reborn. This newly acquired wisdom was passed on to his people in the form of Runes. 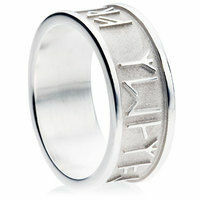 Today people use runes as engravings on wedding rings and other jewelery as a form of passing on secret messages of love and devotion. 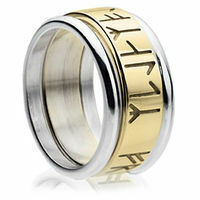 Rings engraved with runes are included in the 30 day returns policy, however because the runic engraving process irreversibly alters the rings a) we do not refund the cost of the engraving and b) we deduct another $30 to remove the engraving.